The Sinn Féin president said the man took issue with comments he made in a radio interview linking bugging at the GSOC offices to the ombudsman’s inquiry into garda collusion with Boylan. 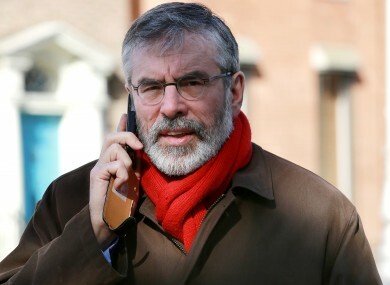 SINN FÉIN PRESIDENT Gerry Adams said today that he was contacted by a man claiming to be convicted drug dealer Kieran Boylan after comments he made in a radio interview about GSOC’s investigation of garda collusion with the man. The Garda Ombudsman’s office investigated claims that Boylan was involved with individual gardaí, that he acted as an informer and that it was known that he was importing drugs while he was working with them. This came after a number of drug charges against Boylan were dropped without any explanation. That investigation was concluded in December 2012 and a file was sent to the Director of Public Prosecutions for consideration but no member of the force has been prosecuted. Garda Ombudsman, Kieran Fitzgerald, has said his office felt it necessary to conduct security sweeps following a number of sensitive investigations in 2012, including Boylan inquiry. Adams said the man who contacted him complained about journalists having personal details about him. I told Mr Boylan that Sinn Fein had a responsibility to raise these issues, and that if GSOC the body set up to have oversight on the garda is being bugged, it is a very serious issue and we have a responsibility to find out if it is true and who is responsible. Adams said he also put it to the man that his case was being linked to this and that “if he had concerns regarding public comment about him, that he should come out publicly to outline his position”. Email “Adams contacted by man claiming to be convicted drug dealer Kieran Boylan”. Feedback on “Adams contacted by man claiming to be convicted drug dealer Kieran Boylan”.